We love garlands! Well I love them too!! Our new garlands are a sweet, simple and oh so fun. They are perfect to drape and decorate a bedroom or playroom. 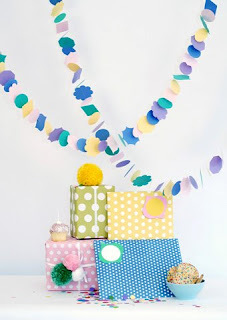 And we think every birthday party needs a garland or two for a festive and colourful touch. The garlands are made from die-cut card stock paper and strung on clear, sturdy thread which is looped at both ends for hanging. Delivered flat packed in a lovely envelope which makes a sweet gift presentation. Available in 7 colour combinations.